Imported by Caballeros, this mezcal is 100% agave (though not the blue Weber variety used for tequila). It's produced in Oaxaca, the traditional home of mezcal. Because mezcal doesn't conme under the same stringent regulations as tequila they are often of inferior quality (like mixto tequilas but, er, worse). This isn't one of those. This is a single barrel bottled mezcal - 100% agave - handmade because, well, you can't scale up production the way you can when making tequila. The Piñas are baked underground for days in a pit, then crushed (sometimes even trodden) to extract the sugars and starches, then cooked in clay or bronze tanks covered with dirt and heated by logs. 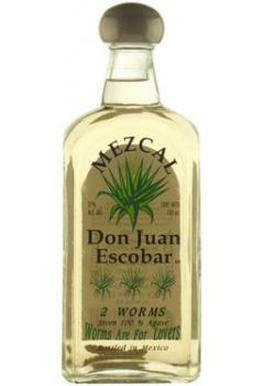 It's smokey, full of agave flavour with an inherant sweetness. And there are worms (two of them) lurking in the bottom of the bottle, waiting for Sydney Uni students or a blushiing Hen to come fish them out. Superb / Highly Recommended, Wine Enthusiast. Silver Medal, SF World Spirits Competition. Gold. Lanolin and honey aromas. A soft round entry leads to a dry light-to medium-body with honey, grassy herbs, flax, caramel, salt, light spice. Finishes dryly with a honeyed oak barrel note. Smoky and more understated and delicate than the Scorpion Silver. Dry, with a bouquet of lime, citrus, and cucumber - salt, and savory herbs, and on more warming: char, creosote, some spiciness. The oak aging even at only 6 months shines through. Dry and sweet at the same time somehow, with citrus, leather, dry smoke and lime, hints of cardamon, nutmeg...look, it goes on like this for some time, but it tastes good, ok? 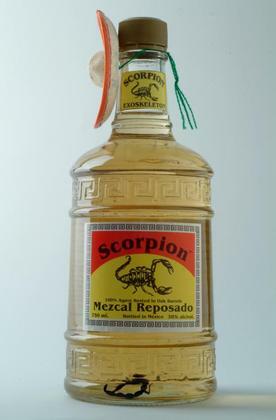 It's artisan-made in small batches in Oaxaca, Mexico, with a real scorpion in every bottle. Ideal for Hens, spring-breakers and Sydney Uni students of course.